How To Get Health Card? 1. Employees and Pensioners have to apply for health card for self and for the dependent family members. They have to apply online at the official website ehf.gov.in. If they submit online application form successfully, then the submitted application forms will be scrutinised by Aarogyasri Health Care Trust (AHCT) officials. 3. The approved applications will be sent online, for printing of Health Cards for each individual beneficiary. 5. The entire applicant family will thereafter go to the designated CIC, give the individual beneficiary finger prints as acknowledgement and receive the permanent cards. How To Download Health Card? Health Card Download process is simple. 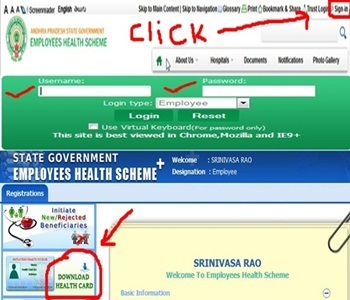 Employees/Pensioners of AP/Telangana have to log in to the official webiste with their User ID and Password. User ID is Treasury ID Number for Employees and Pension PPO Number for Pensioners. Password has already been sent to the all registered members on their registered mobile number. If anybody lost/forgot his password, then the same can be retrieved by clicking 'forgot password' link. After getting new password, employees/pensioners have to log in to the website. Then they can see the option "Download Health Card" at the left side (Check the below picture). Just click that link, and your health card will then be downloaded to the computer. Pension payment order of pensioner. Birth certificate in case of children below 5 years. Aadhaar Enrollment No is having (14 on left side+ 14 on right side and enter without special characters. If rejected by your STO/APPO, again you can edit and resubmit for approval from your login.